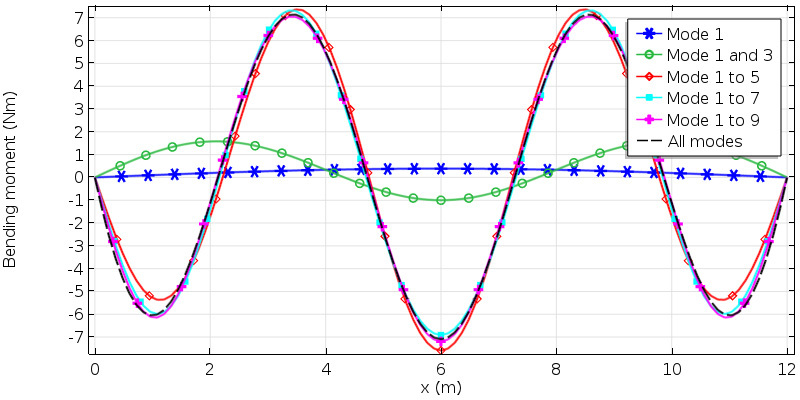 When performing dynamic response analyses of linear structures, mode superposition is a powerful technique for reducing the computation time. Using this method, the dynamic response of a structure can be approximated by a superposition of a small number of its eigenmodes. Mode superposition is most useful when the frequency content of the loading is limited. It is particularly useful when performing analyses in the frequency domain, since the loading frequencies are known. Wave propagation problems are not suited for this technique, as they involve very high frequencies. Mode superposition is a common tool in seismic engineering, since the frequency content in earthquakes is limited. Image by FritzDaCat — Own work. Licensed under CC BY-SA 3.0, via Wikimedia Commons. where is the mass matrix, is the damping matrix, and is the stiffness matrix. The degrees of freedom (DOFs) are placed in the column vector and the forces in . Often, the matrix form is obtained from a discretization of a physical problem using the finite element method. If N denotes the number of DOFs, the matrices have the size NxN. Here, it is assumed that the matrices are real and symmetric and that the stiffness matrix is positive definite. This is the most common case, but it is also possible to use mode superposition in the case of unsymmetric matrices. This could happen, for example, in a coupled acoustic-structural problem. The theory when using unsymmetric matrices is somewhat more complicated, but the principles are the same. If mass matrix normalization is used, the diagonal matrix consists of the squared natural angular frequencies. Here, are the modal amplitudes. If all eigenmodes of the system were used, this would be an exact, rather than approximate, relation. Since the eigenmodes are orthogonal, they form a complete basis and the expression is merely a change of coordinates from the physical nodal variables to the modal amplitudes. When only a small number of eigenmodes are used, the mode superposition can be viewed as a projection of the displacements onto the subspace spanned by the chosen eigenmodes. where the modal DOFs have been collected in the column vector . However, it should be noted that in real life, there is often some crosstalk between different vibration modes in a damped structure. If strong physical damping is present, like when discrete dashpots are used, it is preferable to use the coupled system. Directly providing the damping ratio for each mode, , is a common choice. Modal damping gives a large degree of control. 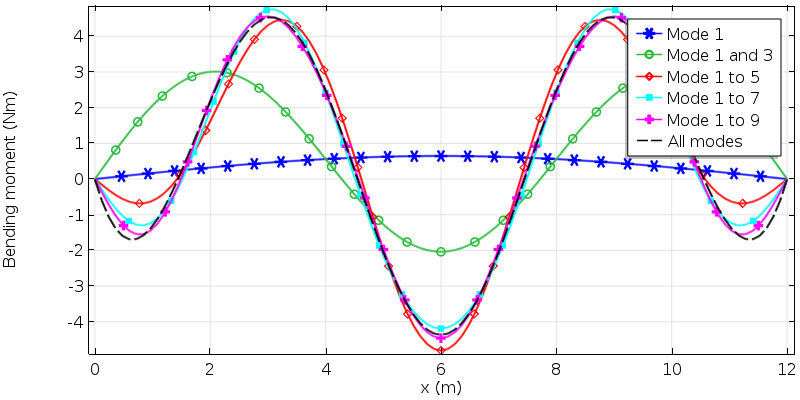 Modes can be assigned a higher damping value if, for physical reasons, they are expected to be strongly damped. where and are the two parameters of this model. The coefficients and are usually chosen so that the damping is reasonable at two different frequencies in the interval of interest. The merit of the Rayleigh damping model is its simplicity; it does not have any physical significance. Rayleigh damping is the special case of using the first two terms of the Caughey series. In practice, a Caughey series approach is seldom used. One possible way to create a diagonal modal damping matrix is to use some kind of lumping scheme on to create a diagonal matrix. The simplest such scheme would be to just drop all off-diagonal elements. The modal load is a projection of the external load onto each of the eigenmodes. If a load has a very small projection on a certain mode, such a mode does not need to be included in the superposition. A common case is when both the structure and the load are symmetric. All antisymmetric eigenmodes can then be ignored, since there is no projection of the load on these modes. Since only a small subset of the modes is used in the response analysis, some fraction of the total original load is lost during the projection to the modal coordinates. Various schemes for improving the solution are available; for example, static correction, mode acceleration, and modal truncation augmentation. In general, to obtain good stress results, more modes must be used in the superposition than what are needed for a good representation of the displacements. This is because higher modes generally have more complex mode shapes. The derivatives of the displacements (that is, the strains) are thus relatively higher. Examining modal stresses for the individual eigenmodes can indicate their relative importance. All eigenmodes will have zero displacements in DOF where the displacements are constrained. Thus, it is not straightforward to model an excitation by a moving foundation using mode superposition, since such a displacement is not contained in the base spanned by the mode shapes. However, a common case is that the whole foundation moves synchronously, such as a building subjected to an earthquake. The analysis can be performed in a coordinate system fixed to the foundation. This implies that the acceleration of the foundation is instead transformed into volume forces. There is also a technique that is commonly referred to as the large mass method. In this approximate method, each nonzero-prescribed displacement is replaced by a very large point mass. This will give rise to a few very low eigenfrequencies in which only the masses are moving, but all other eigenfrequencies and modes will be almost unchanged. In effect, this means that the set of shapes available in the superposition has been augmented by something rather similar to the static solutions to unit-prescribed displacements. A simply supported beam. A simply supported beam. which, with the selected values, evaluates to . where are the arbitrary normalizing constants. Let us consider a distributed load with constant intensity per unit length. Except for changed constant multipliers, it can be noted that the term 2k + 1 has moved from the denominator to the numerator. 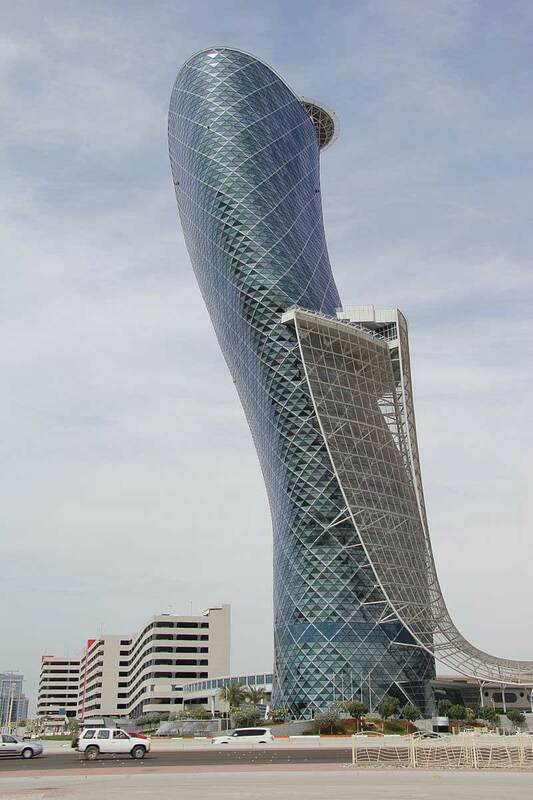 This means that the higher modes are influencing the bending moment (thus the stresses) more than the displacements. In the table below, the modal loads and modal amplitudes are computed for the first ten eigenmodes for the value . 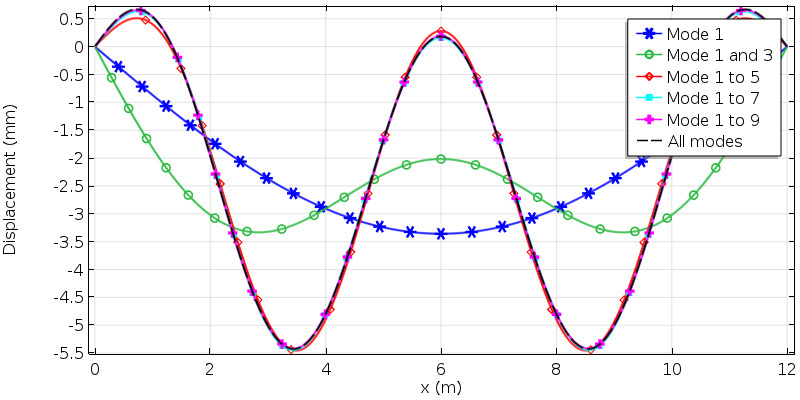 The modal amplitudes decrease in higher modes ( ), since . Contributions to the displacement from the first ten modes. Contributions to the displacement from the first ten modes. 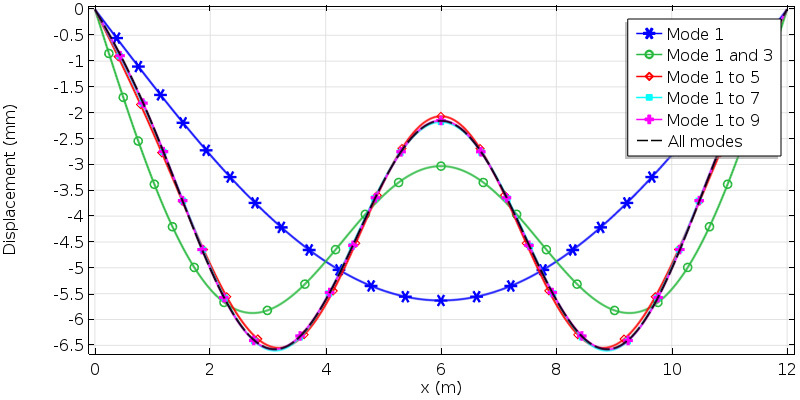 The displacement along the beam after successive summation of the modes. 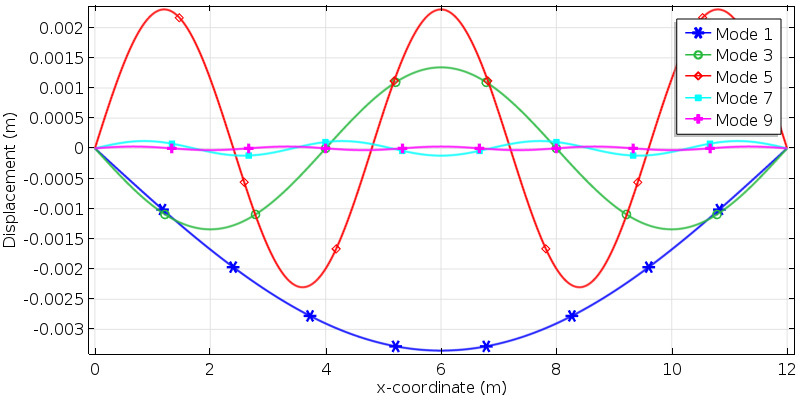 The displacement along the beam after successive summation of the modes. The displacement results are already well converged when summing modes 1, 3, and 5. In order to get a good representation of the bending moment, mode 7 must, at least, also be included. The bending moment along the beam after successive summation of the modes. The bending moment along the beam after successive summation of the modes. In this example, the response is strongly dominated by a single mode: mode 5. If the forcing angular frequency is shifted from 22 rad/s to 17 rad/s, we move away from the resonance. The results are shown in the following figures. The displacement is now dominated by mode 3, even though the inclusion of mode 5 is necessary to get an acceptable solution. The bending moment, however, is still dominated by mode 5. The displacement along the beam after decreasing the forcing frequency. The displacement along the beam after decreasing the forcing frequency. A bending moment along the beam after decreasing the forcing frequency. A bending moment along the beam after decreasing the forcing frequency.